James A. Baker, III, former United States secretary of state and one of only four persons who have received the Sam Houston Humanitarian Award, will come to Sam Houston State University on Oct. 16 as the featured guest for the President’s Speaker Series. The event will take place at 11 a.m. in the James and Nancy Gaertner Performing Arts Center Concert Hall. Admission is free and open to the public. Baker is no stranger to SHSU—he was the first recipient of the university’s Sam Houston Humanitarian Award, established in 1993 in honor of the 200th birthday of Texas hero Sam Houston, and he delivered the spring commencement address for SHSU in 2004. Baker has served in senior government positions under three U. S. presidents. He served as the nation’s 61st secretary of state from January 1989 through August 1992 under President George H. W. Bush. During his tenure at the State Department, Baker traveled to 90 countries as the United States confronted the unprecedented challenges and opportunities of the post-Cold War era. 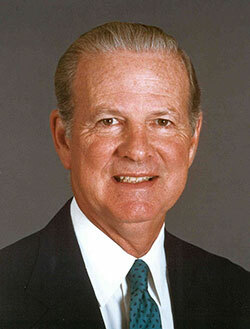 Previously, he served as the 67th secretary of the treasury from 1985 to 1988 under President Ronald Reagan. As treasury secretary, he was also chairman of the President’s Economic Policy Council. From 1981 to 1985, he served as White House chief of staff to President Reagan. Baker’s record of public service began in 1975 as under secretary of commerce to President Gerald Ford. It concluded with his service as White House chief of staff and senior counselor to President Bush from August 1992 to January 1993. From 1997 to 2004, Baker served as the personal envoy of United Nations Secretary-General Kofi Annan in seeking a political solution to the conflict over Western Sahara. In 2003, Baker was appointed special presidential envoy for President George W. Bush on the issue of Iraqi debt. In 2005, he was co-chair with former President Jimmy Carter of the Commission on Federal Election Reform. In 2006, Baker and former U.S. Congressman Lee H. Hamilton served as the co-chairs of the Iraq Study Group, a bipartisan blue-ribbon panel on Iraq. In 2008, Baker and the late Secretary of State Warren Christopher served as co-chairs of the National War Powers Commission. A native Houstonian, Baker graduated from Princeton University in 1952. After two years of active duty as a lieutenant in the U. S. Marine Corps, he entered the University of Texas School of Law. He received his law degree with honors in 1957 and practiced law with the Houston firm of Andrews and Kurth from 1957 to 1975. Baker received the Presidential Medal of Freedom in 1991 and has been the recipient of many other awards for distinguished public service, including Princeton University’s Woodrow Wilson Award, the American Institute for Public Service’s Jefferson Award, Harvard University’s John F. Kennedy School of Government Award the Hans J. Morgenthau Award, the George F. Kennan Award, the Department of the Treasury’s Alexander Hamilton Award, the Department of State’s Distinguished Service Award, and numerous honorary academic degrees. Baker is currently a senior partner in the law firm of Baker Botts. He is honorary chairman of the James A. Baker III Institute for Public Policy at Rice University and serves on the board of the Howard Hughes Medical Institute. The President’s Speaker Series was created in 2002 by SHSU President Emeritus Jim Gaertner and was originally underwritten by the estate of the late Huntsville resident Lu Ellen Gibbs. The series is designed to bring prominent leaders to the Sam Houston State University campus. Speakers are chosen for their ability to deliver messages of substance with the potential to significantly impact the student body.